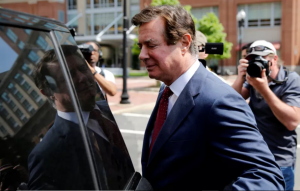 Former Trump campaign chairman Paul Manafort’s trial begins today. See accuracy.org/calendar for upcoming events. In his most recent piece, “The Elite Fixation With Russiagate,” Maté lists a host of Trump policies at odds with Russian interests, and writes: “This consistent record of Trump directly contradicting Putin’s agenda is inconvenient to a collusion-and-kompromat hypothesis, so it is little wonder that it is overlooked. Instead of focusing on policy, the press has engaged in commentary more appropriate for an ice-skating performance. Blake Hounshell of Politico questions why Trump is ‘oddly submissive’ with ‘the diminutive Putin,’ with the American president ‘slumping in his chair’ next to the Russian leader. ‘The way Trump behaves around Putin — quietly bowing and scraping, taking his word over America’s own chief of intelligence,’ writes The Week’s Ryan Cooper, ‘is simply wildly out of character.’ Except that it’s not. Trump has been deferential to many authoritarian leaders — hardly out of character, by the way, for any American president. And if Benjamin Netanyahu is to be believed, Trump even let the Israeli prime minister convince him to nix the Iran nuclear deal.